This is so easy to do, but if you don’t want to spend the time making a template I have one for you. All you need is some scrapbooking paper! I did use scalloped scissors to cut across the top to give them a fancy edge. You might need to make slight adjustments for height and length depending on the size of your cupcakes. Fasten the wrappers together with glue stick or hot glue. Come back tomorrow to for a free digital cupcake wrapper template with some different paper options to drop into the template and print! There will also be a tutorial on how to use the digital template. You might also be interested in these Free Owl Cupcake Toppers. Hello! Would yyou mind if I share your bblog with my myspace group? Thank you for sharing your pattern and ideas. I am cutting them a little wider, extending the top only, to make wrappers that will look like tea cups. I tried and tried to make my own pattern but was having difficulties. Thanks for the tips. I found these beautiful pre made cupcake wrappers for my wedding: http://www.bellacupcakecouture.com/category_1/Cupcake-Wrappers.htm love all their designs plus some fun party supplies too. 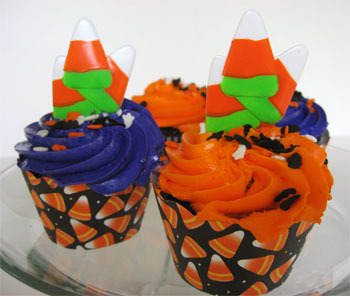 Super fun cupcake decorating idea! I love making cupcakes for our special events. Excellent post. I was checking continuously this blog and I am impressed! Extremely helpful information specially the last part :) I care for such info much. I was seeking this particular information for a long time. Thank you and good luck. Hi, i feel that i noticed you visited my website thus i got here to go back the desire?.I am trying to to find things to improve my web site!I suppose its ok to make use of a few of your ideas!! Thank you so much for providing individuals with a very pleasant opportunity to read from this site. It’s always so enjoyable and also jam-packed with amusement for me and my office peers to visit your website nearly 3 times every week to see the new guidance you have got. And of course, I’m also certainly pleased for the stunning concepts you serve. Some 1 facts in this post are completely the finest I’ve ever had. A million and a half thanks!! I have a bunch you can make for free too! These look so awesome! Can't wait to try! Can you help me, please!!! I am trying to download this template so that I may use them for making Easter cupcake wrappers and can't seem to download the template - says it is not found. Please, help these are awesome and you're so creative - so jealous! :) Thanks so much!! Thank you so much for the template! I printed it out on a 8.5 x 11 paper (the normal size) but the wrappers seem too short for a regular cupcake. What size paper do you use to print it out before you trace it on a scrapbook paper? Just downloaded the template. Can anyone tell me how to do the last step using gimp? I can't get the paper layer to take on the shape of the wrapper. Thank you for the template! I'm going to use scrapbook paper in golds, cream, and chocolate colors for my wedding! I just got into making cupcakes and was looking for the wrappers so when I came across your site I thought you had the the coolest ones thanks for the templete. You have a really cool site and thanks for all your neat ideals. Thank you so much. Finding templates as good a these are so hard to find on the web! I love this template! It's so easy to use and gives you great results the first time...especially if you've never made or used a cupcake wrapper before. Thanks so much for posting this. I tried to make my own and you figured it out for me. I took a copy of the wrapper and shrunk it to %75 on my copy machine and could use it for mini cupcakes. I am just here for the zillionth time downloading this template, and I wanted to say thank you!! You have no idea how useful and easy and beautiful it has been and I am just SO grateful that you are so willing to share!! Thanks so much! OMG these seems great but... when you cook your cupcakes do you cook them with the scrapbook paper?? or do you you just glue it after they are all cooked?? Thank You so much for sharing! these are great!! Please visit www.cakesandcookies.co.za where you will find the South African answer to your wrapper needs. Thank you so much, I've been wanting to make my own but wasn't sure how to make a template, I'm lucky I found this, can't wait to try it! OHH I love you! I mean I loved you before but I just found this post and it is a life saver. I was having the hardest time finding the right cupcake liners for my daughters birthday. I am so excited to make mine own! Awesome. I've been buying these but would like to be able to customize them more, which I can now! Thanks! Wow- your giving this away for free? Cool. I just got a ton for my wedding at www.bellacupcakecouture.com. I LOVE them! Glad I don't have to make for my big day but will be handy for future small events. Thanks! Thank you for sharing! I'm sure these will come in handy for many more occasions as well. I can already see them at Thanksgiving and Christmas as well! Thank you for the idea and for the template! Stretches the imagination and the budget at the same time! AWESOME - I have seen those around and wondered how they were made. THanks so much for the template! These are so cool! Thanks for sharing. 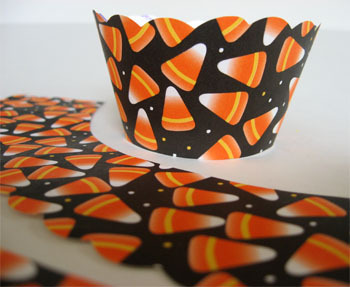 Did you make the cute candy corn toppers too? Wrappers would have been so cute for the rainbow of cupcakes I made for my daughters birthday. Oh, well, I'll store that idea for next time. Just wondering what is on the bottom? Do you just put this around a regular cupcake paper after baking? Thanks! Awesome idea! Thank you so much for sharing. I will definitely use this pattern! What a neat idea! Thanks for the download! I'm not very good at paper crafts so getting help makes it much easier! seriously am in love with all your ideas-watch out martha stewart! These are very cute cupcake wrappers. What a good idea. Thank you, Thank you, Thank you!!! I have trying to find a template like this on the web forever! Can't wait to start making my own for my daugther's 16th birthday in December. wow so very smart!! thanks!! these come in so handy!! Thanks for sharing!